Using commodity hardware and the “plug-and-play” NumaConnect interconnect, Numascale delivers true shared memory programming and simpler administration at standard HPC cluster price points. One such system currently offers users over 1,700 cores with a 4.6 TB single memory image. 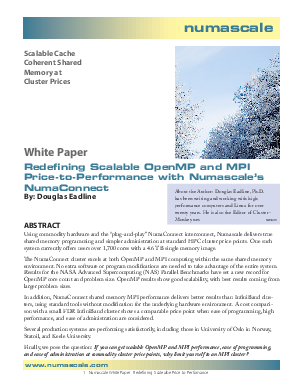 The NumaConnect cluster excels at both OpenMP and MPI computing within the same shared memory environment. No extra software or program modifications are needed to take advantage of the entire system. Results for the NASA Advanced Supercomputing (NAS) Parallel Benchmarks have set a new record for OpenMP core count and problem size. OpenMP results show good scalability, with best results coming from larger problem sizes. In addition, NumaConnect shared memory MPI performance delivers better results than InfiniBand clus­ters, using standard tools without modification for the underlying hardware environment. A cost compari­son with a small FDR InfiniBand cluster shows a comparable price point when ease of programming, high performance, and ease of administration are considered. Several production systems are performing satisfactorily, including those in University of Oslo in Norway, Statoil, and Keele University.